Wow Titan the Robot really is an entertainment concept unlike anything on earth and he is very noisy! I am performing 4 shows a day at this 2 day festival, 3 shows for schools during the day and then an evening one for the public…. so last show will be in 2 1/2 hours time… and once again timetabling means I will be competing against Titan the Robot.. so I have changed the timetable as I lose! The corridor out side of my performance zone just happens to be Titans entrance alley way and boy does he make an entrance. He is massive, loud, scary and funny all at the same time. The noises dragged my audience away from me… which was really okay with me as I then too got to see the Titan Show. Dave is his minder and driver and he looks as though he should be in a Men in Black Movie… Titan sings and dances teases the audience with witty repartee whilst also getting very up close and personal. The children (and adults) are not sure whether they should be scared or amused so facial expressions are a picture… He burps and farts and cries tears (rivers of tears) at times over the audience…. and he is just one small part of the Intelligent Systems Festival itself. Within the main auditorium visitors get to interact with lots of computer and robotised programmes and systems. One robot is given a rubix cube … it visualises all sides then solves it… awesome.. he then goes on to make toast! TechFest, Aberdeen are also here with K’Nex and other interactive activities along with the NI Segway company… I so enjoyed my ride on one.. … and then there is my Technology Science Show. Which is a show based on my pink electric guitar. My audience are taken on a journey about sound, electricity, magnetism and then finally electromagnetism. Lots of volunteers are used and the ultimate job by one of them is to play the guitar itself… we then use the Garage band app on my ipad to record the playing and singing and show how easy it is to up load onto iTunes… We finish the day with my favourite demo…. Sending Peppa Pig into Space. Plumbing pipes and a vacuum cleaner are used to make a Bazooka Rocket Launcher .. Awesome! 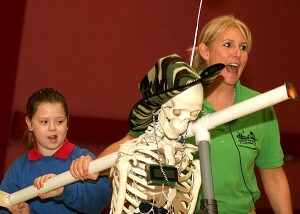 If you want to have a smaller not so expensive robot come to your school, check out the images of Fred (who’s dead) in the show photo gallery – Funky Forces- Martin Bradley and his team at Letterkenny IT helped me turn a skeleton into a singing and dancing robot for the Discover Primary Science Awards Shows. The Intelligent Systems Science Festival is being held in The Venue, the purpose build exhibition space for celebrating Derry – Londonderry as being the city of culture. There are over 50 exhibitors and the event is not only hands-on but is FREE and is organised by the University of Ulster.